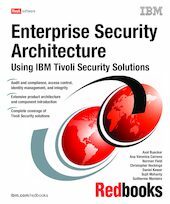 This IBM Redbooks publication reviews the overall Tivoli Enterprise Security Architecture. It focuses on the integration of audit and compliance, access control, identity management, and federation throughout extensive e-business enterprise implementations. The available security product diversity in the marketplace challenges everyone in charge of designing single secure solutions or an overall enterprise security architecture. With Access Manager, Identity Manager, Federated Identity Manager, Security Compliance Manager, Security Operations Manager, Directory Server, and Directory Integrator, Tivoli offers a complete set of products designed to address these challenges. This book describes the major logical and physical components of each of the Tivoli products. It also depicts several e-business scenarios with different security challenges and requirements. By matching the desired Tivoli security product criteria, this publication describes the appropriate security implementations that meet the targeted requirements. This book is a valuable resource for security officers, administrators, and architects who want to understand and implement enterprise security following architectural guidelines.